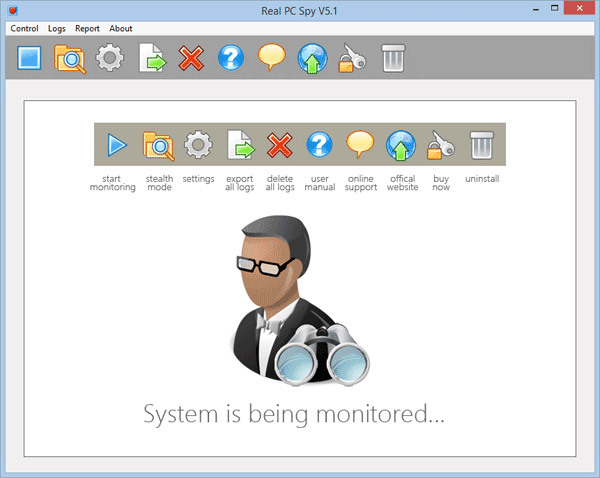 Real PC Spy software is a smart computer surveillance software that lets you know exactly what people do on a PC. It records all PC and internet activities, including typed keystrokes (keylogger), chat conversations, emails read, web sites visited, MySpace & Facebook usage, computer games, online shopping and searches, video talk, documents opened, clipboard text and more. Real PC Spy software runs in a complete stealth mode and no one except system owner could be aware of its presence on the machine. Hidden monitoring tool once installed on the machine will not appear in Desktop, Add-Remove program list, Start menu and even hidden in installation paths. Real PC Spy software is fully password protected that restricts unauthorized users to change the software configuration settings. It starts automatically each time your windows start and facilitates users to access the software when running in stealth mode with specified hotkey. Easy-to-use user interface with user manual for easy processing and installation of software even for beginners. I know great software for android which helps you to spy any text messages you need from your girlfriend or somebody http://copy9.com/spy-on-text-messages/ try to, I like it and can't live without it.